The BBC Wonders – Can you be too tall? Can you be too tall? 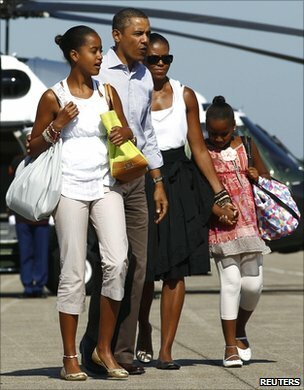 Recently it was reported that President Barack Obama’s daughter, Malia, 12, has reached the height of 175 cm (5ft 9in). It has highlighted once more the social implications of being tall for your age. In the past, some parents have wished for their tall girls to be shorter, and the other way round for boys – and requested medical intervention. Families are advised to see a GP if worried about their children’s growth, as it could have an underlying reason. But when there is no diagnosis of an underlying medical problem, it is now rare in the UK for medical treatment to be given to limit or boost children’s height for purely social reasons. Growth hormone is not currently offered by the NHS, but it is available privately. In the US this treatment can cost up to $50,000 (£31,975) per year if a child needs high doses. Until the 1990s, however, it was common for hormone treatment to be offered to girls to limit their adult height. It was felt that girls who were “too tall” would be unhappy and would never get married. Peter Hindmarsh and Tim Cole of the Institute of Child Health at University College, London, say they still get a few families who consult them hoping to stop their daughter from growing too tall. The treatment they can offer involves giving girls synthetic oestrogen in fairly low doses, which leads to the onset of puberty, and limits growth. Nowadays it is rare for families to take up this treatment, said Prof Hindmarsh. “I recently bumped into one of the last girls we treated, about seven or eight years ago, on a railway station,” he explained. He said this young woman seemed very comfortable with her height. Experts say families are right to consult a GP if their child appears to be at the upper limits of growth, because there are syndromes that cause other medical problems, but which have as their main symptom tall stature in childhood. Marfan Syndrome, which can cause problems with the eyes, heart, and major blood vessels, is usually noticed because a child grows very tall. However, treating girls with oestrogen to limit their adult height was common from the 1950s through the 1990s in many countries – especially Australia, the US, the Netherlands and Scandinavia. In some countries the percentage of wife-taller marriages is nearer 8 or 9%. If people chose their spouses randomly, then many couples would be like this. In these cultures – such as in the Gambia, and among the Hadza hunter-gatherer people in Tanzania – men and women do not seem to choose partners by height. Psychologists have looked at whether this made girls any happier. An Australian study compared girls who had thought about being treated, but decided not to, with those who had gone ahead with treatment. They followed up the girls when they were between 23 and 55 years of age, and found that women who had decided to get treatment were no less likely to have suffered mental health problems. In the US, too, a study looked at women in the general population and in a survey of nearly 60,000 adults found that tall women were generally very happy with their height – 77% of women who were 183cm (6ft) were happy with their height. One classic reason for families wanting their girls to reach a shorter adult height has been that parents were worried their daughter might never marry. But the US study also found that it made little difference how tall women were. Even the tallest women were very likely to be in a relationship. At the other end of the spectrum, far more families seek help for a short son than a daughter. As with very tall children, some children are short because they have a clinical syndrome, and some are just short – they have no hormone deficiency or other problems. If children have the genetic disorder Turner Syndrome, a growth hormone deficiency or some other syndromes, NHS guidelines allow for growth hormone treatment to be given to increase height. Tom Wyllie is 17, and lives in Northumberland. When he was a child, his parents noticed he was not growing as they expected. He was diagnosed as needing growth hormone supplements for medical reasons and he still has a daily injection. He has reached his final height of 157 cm (5ft 2in). But he has not let it stop him aim for his goal – to be a professional musical theatre actor. He has already been in Oliver!, Annie, Godspell, Chicago and has auditioned for Britain’s Got Talent. “I’ve been performing pretty much all my life, it’s been my lifelong ambition, since the age of six,” said Tom. Tom Wyllie says that the girls on his drama course are not concerned that he is short. His says his main problem is that he looks a little younger than he is, and often has to show ID at the cinema or when renting a 15-rated DVD.